Run-of-the-mill is a term that describes something that is of average quality, something that is mean, or cookie-cutter. Usually the term is used to depreciate things; but something mean does not necessarily have to be something bad. On the contrary, run-of-the-mill may refer to characteristics or features that we value and use on a daily basis, for example a visible caller ID on the smartphone, a DVD player with good usability, high-performing USB sticks and so on. Why is that? Threshold attributes are taken for granted. Customers become aware of them only if they are missing because these attributes are expected. It is not possible for people to articulate them. A mute option for cellphones is an example for this; it is expected. Missing threshold attributes create dissatisfaction; their existence, on the other hand, does not create increased satisfaction. Performance attributes are explicitely requested by customers and have direct impact on their satisfaction. Performance attributes stand for the quality of a product, e.g. fuel consumption in vehicles or pace of delivery for online shopping. Missing performance attributes create dissatisfaction; if they are exceeded the satisfaction increases. These attributes can be elicited through interviews or surveys. Excitement attributes are the kings of all the attributes. As the name says, they are able to get customers excited. They are not expected and a lack of them does not create dissatisfaction. But a single excitement attribute may create disproportionate satisfaction for the customer. The first smartphone featuring swiping technology created a lot of excitement and made it possible for a former computer manufacturer to conquer a market that had been overflowing with manufacturers for years. Indifferent qualities neither lead to satisfaction nor dissatisfaction. They simply offer no added value to the customer. If you do not own a trailer, would you care for a trailer coupling? There are also reverse qualities; their existence leads to a rejection of a product. Are your wheel rims covered in rust as soon as it begins to snow? 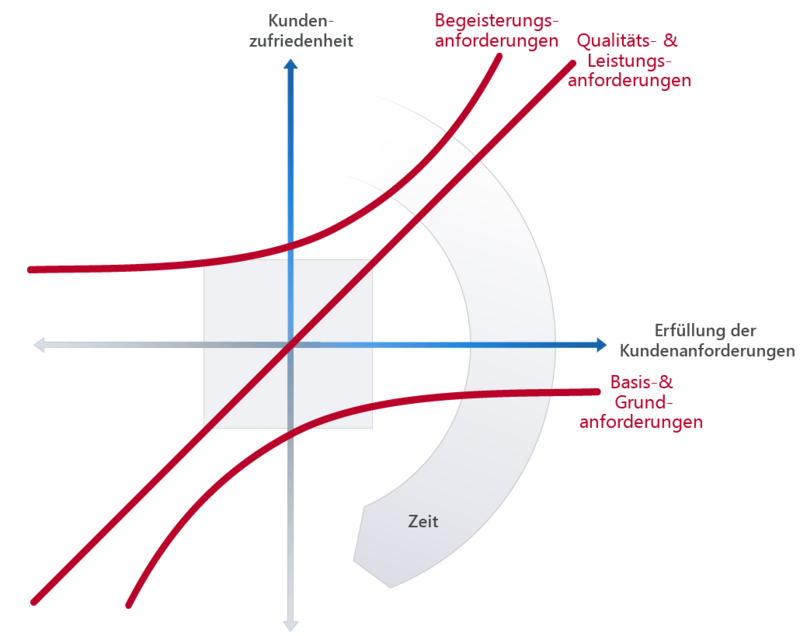 The vertical axis describes the customer satisfaction, the horizontal axis describes the realization of customer requirements. Performance attributes are indicated by a straight line, threshold attributes and excitement attributes are indicated by an exponential curve. The indifference zone indicates requirements that are more or less realized. 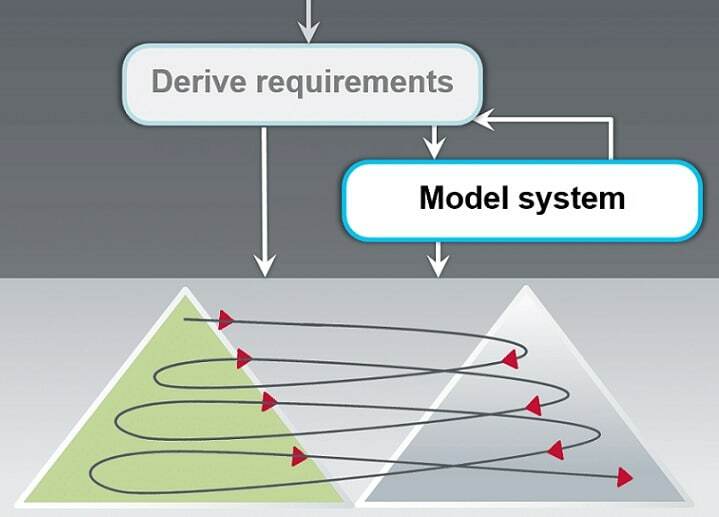 The model provides no insight into concrete values but they show the connection between the realization of customer requirements and customer satisfaction. It shows that increasing the number of threshold attributes does not help to differentiate a company or product from competitors. 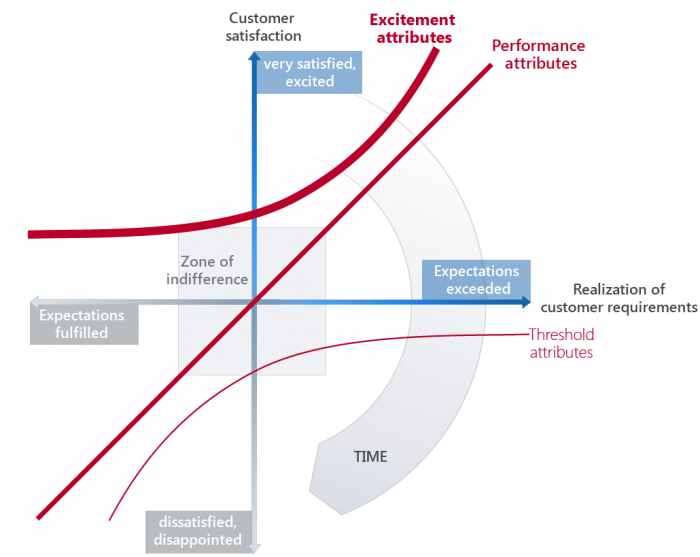 Performance attributes have direct impact on customer satisfaction. Excitement attributes are the best means of setting yourself apart in the competition. How, then, is it possible to find excitement attributes? Maybe you are a creative person or utilize methods such as the Design Thinking Method? Or you transfer excitement attributes from one sector to another? When will heads-up displays be available for motorcycle helmets? When will your mailbox notify you of important letters and messages? Excitement attributes, just like performance attributes, tend to lose their initial appeal over time. Still excited about that retractable roof in your car? About customizable ringtones? Maybe, but are you as excited as you were when these features were the next big thing? Threshold attributes may have been performance attributes and maybe even excitement attributes before. Even steering wheels in cars once were an exciting experience. And sometimes threshold attributes are just marketed as performance attributes. Of course there is no panacea to find the next excitement attribute for your product or the market you are in. In addition, threshold attributes may not help you to differentiate yourself from competitors but they do offer real benefits. Imagine a manufacturer of DVD players decides to make the simple process of spinning the DVD more interesting by adding a transparent lid and moving the lid to the top instead of the front. Neat idea; the problem is that inserting a DVD is now impossible for you since the DVD player rests inside a flat cupboard. If threshold attributes do not help to differentiate it means that customers know them and are able to use them. Keep that in mind the next time you buy a DVD player or rent a car; if you are looking for the fuel door, remember: it may be located directly behind you in the b-pillar. Run-of-the-mill, you see? 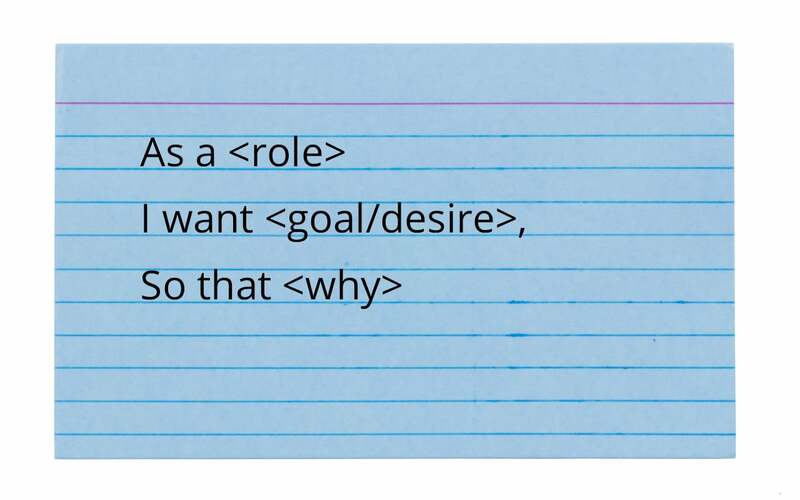 Can user stories be good requirements? Subjective Complexity Project Launch – Why Is It So Difficult?